As you all know, I spent the entire weekend in Raleigh for the ninth annual Hopscotch Music Festival. My Thursday recap is here. My recap of the Friday day parties is here, and my recap of Friday night is here. As I have done for the last couple of years, I used Saturday afternoon as a resting period and I skipped most of the day party stuff. Friday was a really long and really busy day, and I definitely needed the time both to write and to reset. The only day party thing I had on my plate was a solo set by the fantastic drummer Kid Millions. I finally made it downtown at about 3:15, got some late lunch and headed over to Neptune’s for what I thought would be a really cool drumming clinic. He’s the drummer for Oneida and has done a lot of collaborations with a lot of people over the years, including a day party show with harpist Mary Lattimore two Hopscotches ago. What he did wasn’t exactly a “drumming clinic”. He told a long personal story about being in a pretty bad car crash. The story was punctuated by drum fills. It was a little odd, but still really good. After the Kid Millions thing ended, I immediately went upstairs hoping to catch some of the set by Eric Bachmann out of Archers of Loaf. It was already over by the time I got up there. It was almost time for the stuff in City Plaza to start, so I headed down there and waited. And waited. It was that weird part of the day when they’re trying to clear everyone out of the plaza from the “open” part of the day before letting people back in for the festivities. They ended up being really late with the gates, and although Zack Mexico was supposed to go on at 5:15, they didn’t start until about 5:45. I had seen the band from Kill Devil Hills, NC at a Hopscotch a few years back, and they sounded different this time than I remembered them being. Their brand of psych rock is inoffensive, but not very exciting to me. For some reason, they have two drummers who play the exact same thing, and that’s totally unnecessary. They had been allotted something like 35 minutes, and despite the late start, they played even longer than they were supposed to. This meant that Speedy Ortiz was waaaaay behind schedule. Speedy Ortiz finally hit the stage about 40 minutes after they were supposed to, but they put on an amazing show. The indie rock quartet from Northampton Mass released their third album this year, and they’ve drawn comparisons to PJ Harvey, Liz Phair, Pavement, and many of the other indie rock greats of the 1990s. You may remember that I’ve gone on and on about how their frontwoman Sadie Dupuis is a ridiculously smart woman. She studied maths and music at MIT for a while, then changed her plan and got an undergraduate degree in poetry from a small college. Then she got an MFA in poetry from UMass. She writes great songs, plays a mean guitar, and knows things. Enough about that, though. 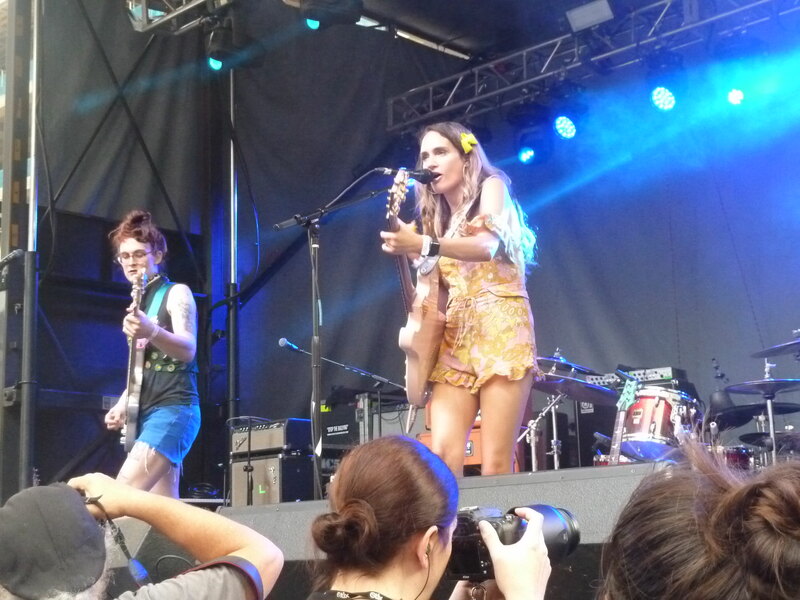 The Speedy Ortiz set was fantastic, but I felt like they didn’t play long enough. They played Hopscotch in 2013, but I didn’t see them for some reason. It seems like that was the year that I missed a lot of great stuff. 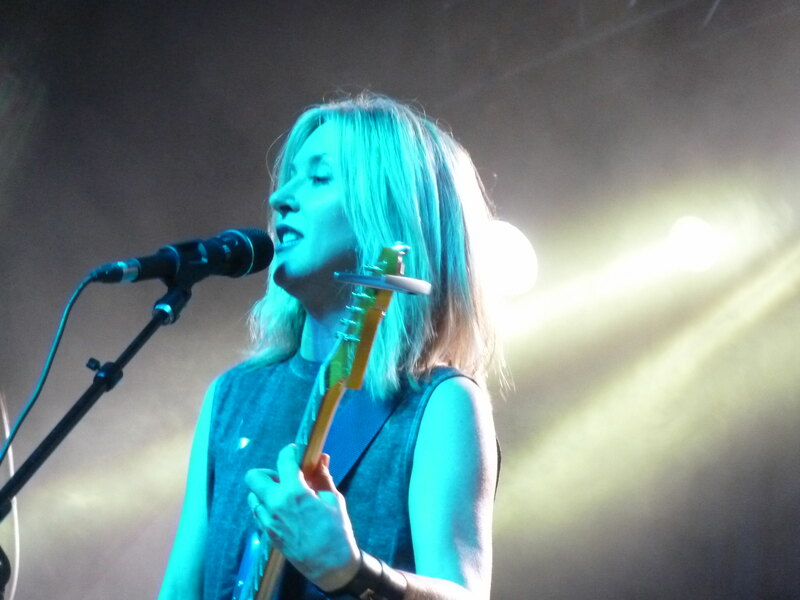 Next up was the much anticipated set by indie rock legend Liz Phair. Her 1993 debut Exile In Guyville set the college radio and indie rock worlds on fire and she has now influenced multiple generations of young female indie rockers. Her next three records were sort of hit-and-miss for me, with 1998’s whitechocolatespaceegg being my clear favourite of those albums not named Exile…. In the aughts, she put out a couple of records that didn’t do much for me, and then a record in 2010 that I didn’t even know about. When it was announced that she was going to go on tour this year and that she would play Hopscotch, I guessed that she would lean pretty heavily on her older catalog, and that’s exactly what we got. Of the twelve songs they played, six were from Exile. I never got to see her in the 1990s, and it was awesome to get to do so now. I had a ton of fun during this set, and I was honestly a little surprised to see so many younger people who were there just for her. Next was the iconic punk band MC5. Since it’s the 50th anniversary of the band, they’re on the road calling themselves “MC50”. To be honest, the only song of theirs that I know is their trademark “Kick Out the Jams”, and they played that early on. The band these days is made up of founding guitarist Wayne Kramer, Brendan Canty (drums) out of Fugazi, Kim Thayil (guitar) out of Soundgarden, and some others. It was kind of fun, but I didn’t know the songs, and I kind of wanted to move on to the indoor part of the night. Also, somebody near me smelled like a dumpster full of Indian food and cat poop. I made the long hike over to Deep South because I really wanted to see Oceanator. I try to avoid the long hike over there, but sometimes it’s necessary. This was one of those times. I got there as a band called Vanity Plates was finishing up. The room emptied out and I was able to move close to the stage. That’s another one of the venues that has bad sight lines and a stage that’s only about a foot off the floor. As much as I liked the songs that I heard when I did research, I liked the songs even more when I heard them live. They were so loud and so energetic, and it totally blew me away. I also got a really good sense of how freaking good a guitar player Elise Okusami is. Not to take anything away from her band mates, but she’s the unparalleled star of that show. The original plan was to watch only a few of their songs before making the long hike back to the main footprint of the festival, but I stuck around for the whole set. I enjoyed it so much that I stuck around to say hello and I even bought a t-shirt. I make it a point not to buy merch at Hopscotch, but I had to break the rule for this. Speaking of buying things, you should buy their new record here. I made the walk back over to King’s for the set by Calgary indie-folk/rocker Chad VanGaalen. I really liked his 2008 album Soft Airplane, but I don’t know any of his other stuff. I was excited that he was on the schedule, and King’s was actually packed for him. I got there after he had already been on for a few minutes, but I didn’t miss much. During his set, he bantered a lot, and he was sort of funny and sort of nervous. He talked a lot about carrots, swimming in lakes vs swimming in the ocean, Baconators, and some more about carrots. He also said that he was star-struck when he met Mac McCaughan, and that he had to muster up courage to say hello to Mac. The CVG set was really good, and although I had contemplated staying put to watch Ought, I decided to walk over to Fletcher to see ambient noisemaker Grouper again. Indeed the Grouper set was not much like the set she played during the day party on Friday. This time, she had a piano, and she played the guitar much more than she did at the day party. Of course she used her effects pedals and tape loops and all that, and it was completely amazing. It wasn’t a very full house, but everyone was really into it. Because of the nature of her songs, and because of the nature of the venue, it was dead silent in there except for the noises she was making. Even between songs, there was a deafening silence. Nobody made a peep until she was completely done. By the time she finished, it was 1:30, and I was really tired. I was headed for the door when I realized that she was coming back on stage, but I had to call it a night. It was a nice, quiet end to a good day and a great festival. Although I was eagerly anticipating many of the sets on Saturday night, the Oceanator set exceeded my expectations by a long way, and that was my favourite thing of the day, and one of my favourites of the whole weekend. Make sure you see them when they come to your town. 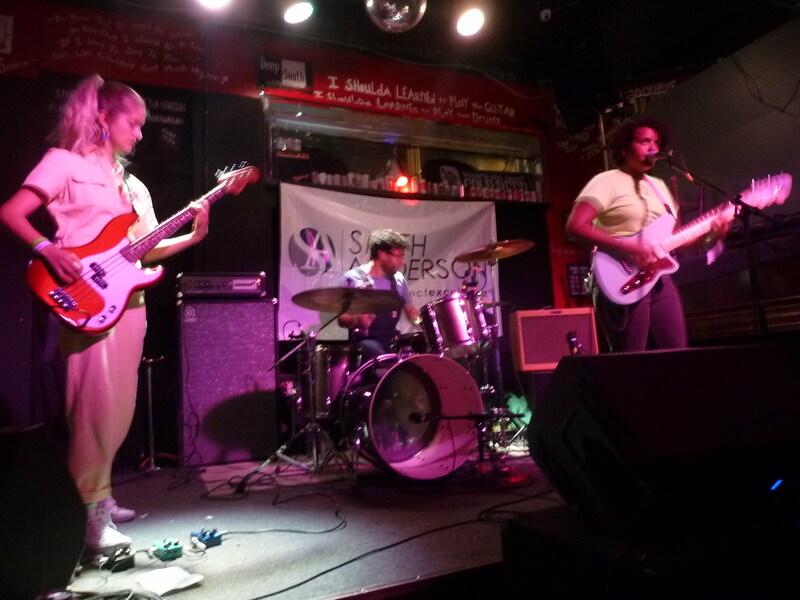 This entry was posted on Sunday, September 9th, 2018 at 9:33 pm	and tagged with Chad VanGaalen, Grouper, Hopscotch 2018, Kid Millions, Liz Phair, MC5, Oceanator, Speedy Ortiz, Zack Mexico and posted in 2018 Hopscotch Music Festival. You can follow any responses to this entry through the RSS 2.0 feed.